Believe it or not, the loving God we read about in the Bible, and the modern god called the Big Bang theory have one thing in common: Both claim to be the origin of the universe! But right there, their commonality ends. It is impossible for both to be right. Then who is wrong, and who is right? Let’s travel back to the source of the Big Bang and see if we can find any substance. All we need to do, is simply turn to the dictionary. No need to explore scientific books explaining complex theories. So this is what one dictionary says about the Big- bang. Big-bang theory n. A cosmological theory postulating that approximately 10,000 million years ago all the matter of the universe, packed into a small super dense mass, was hurled in all directions by a cataclysmic explosion. As the fragments slowed down, the galaxies and stars evolved but the universe is still expanding. (Compare steady-state theory) Reference: The Collins Dictionary of the English Language, Second Edition, Patrick Hanks (ed), 1986, William Collins Sons & Co. Ltd, reprint 1987, Glasgow, United Kingdom. That approximately 10,000 million years ago a super dense mass having no intelligent mind therefore owning no specific purpose or plan and without any particular reason exploded in all directions. And from the hurling fragments which had no intelligent mind therefore owning no specific purpose or plan for no particular reason evolved the galaxies with planets and innumerable stars. As the universe continued to expand without an intelligent mind and therefore owning no specific purpose or plan for no particular reason evolved the formation of our solar system. But miraculously for our good fortune the sun evolved in just the right position with a surface of fiery gas to energise our solar system. And of course in unison with the sun, by chance the moon and planet earth also evolved forming a relationship of cosmic life. Too close to the sun planet earth would incinerate, too far from the sun and planet earth would become a frozen mass. And with the same cosmic motion the moon miraculously evolved in a precise location for gravitational pull upon earth’s ocean tides and magnetic fields penetrating earth’s surface - and all this by mere chance of evolution. And right now throughout the teaming galaxies having no intelligent mind therefore owning no specific purpose or plan for no particular reason the celestial bodies, planets, moons and stars keep their precise orbits by the clock tick of evolution. And so another question looms through the cosmic dust of the Big-bang theory. Where is the universe evolving from here? Is planet earth at the mercy of an uncontrollable universe without intelligence, without purpose or reason but is always evolving expanding into a giant intergalactic monster and who knows if another cosmic explosion might occur, ripping through the universe obliterating our solar system. Sounds frightening! Well to quieten our fears, if we take another step into the source of the Big-bang theory we enter the scientific field of human reasoning; man’s invented calculations and theoretic equations. We may Explore this theoretic field as much as we wish, yet still a logical base line for the Big-bang theory never seems to appear in any source of reality, so then could it be that the Big-bang theory is merely a Big-bang of the human mind? And so from this black hole of human reasonning we turn our eyes to the true origin of the universe, the God of the Bible. 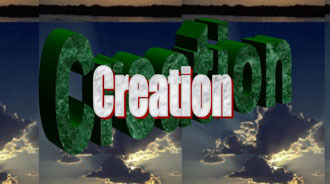 To be equally fair once again, we go to The Collins English Dictionary and turn to the word creation with a capital C.
Creation n.Theol. 1. (often preceded by the) God’s act of bringing the universe into being. 2. The universe as thus brought into being by God. At this point may I refer you to two other books which are based on the scriptures of the Bible? “Who Is God” and a longer read, “The King and His Son”. These two books reveal true answers about God. That God is the origin of the universe, that the universe is an extension of God’s supernatural Being. Yes, God has an intelligent mind, He is the Master Designer and energiser of life with an all powerful purpose based on true love. By God and through God’s power the universe was created, planets and stars precisely placed forming teeming galaxies. Indeed our planet earth did not evolve from a cosmic particle of space but planet earth was created by God to be populated by another creation of His, made in His likeness. Yes God’s creation of the human family. And billions of humans throughout earth’s history have recognised God’s attributes, His character of love manifested through His creation, His supernatural mind that designed the cascading galaxies in patterns of intricacies. Now in modern times many scientists and astronomers peer into the night sky and beholding God’s majesty, proclaim Him as the origin of the universe.